Download seminar report on the topic Artificial Intelligence in Civil Engineering. 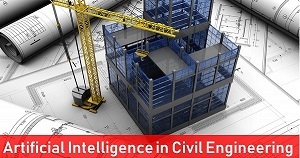 Download PDF seminar report and PPT presentation on AI applications in Civil Engineering. Artificial Intelligence methods have been extensively used in the fields of civil engineering applications e.g. construction management, building materials, hydraulic optimization, geotechnical and transportation engineering and newly added EHS. The objective of this seminar report is to present highlights of references pertaining to artificial intelligence in engineering. The field of artificial intelligence, or AI, attempts to understand intelligent entities as well as construct them to make the operation reasonably simple and easy, correct and precise. Artificial Neural Networks are the typical example of a modern interdisciplinary subject. The sophisticated modeling technique that can be used for solving many complex problems serves as an analytical tool for qualified prognoses of the results. Using the concept of the artificial neural networks and the results of the performed numerical analyses make the field of Civil Engineering more accurate, precise and efficient especially in the fields of smart materials and many more. In the field of civil engineering, it covers a vast area for human benefits especially in engineering design construction management and program decision-making and can solve complex problems to the level of experts by imitating the experts. The traditional methods for design, modeling, optimizing complex structure systems and manual observation of activities are difficult, time-consuming and prone to error, so, AI helps in automated data collection and data analysis techniques to improve several aspects of construction engineering and management for productivity assessment, safety management, idle time reduction, prediction, risk analysis, decision-making and optimizing construction costs. Another seminar report summarizes recently developed methods and theories in the developing direction for applications of artiﬁcial intelligence in civil engineering, including evolutionary computation, neural networks, fuzzy systems, expert system, reasoning, classiﬁcation, and learning, as well as others like chaos theory, cuckoo search, ﬁreﬂy algorithm, knowledge-based engineering, and simulated annealing. The main research trends are also pointed out in the end. The seminar report provides an overview of the advances of artiﬁcial intelligence applied in civil engineering.